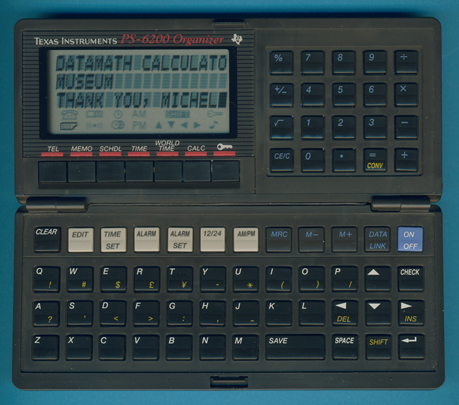 Size: 2.5" x 5.8" x 0.7"
Texas Instruments entered already in 1991 with the PS-6200 the market of Personal Organizers. It is obvious that this rare PS-6200 with the red design doesn't fit into the scheme. Dismantling the featured PS-6200 manufactured in September 1991 by Inventec Corporation in Taiwan reveals no surprises, it is identical with the already known versions. This PS-6200 Organizer was provided by fellow collector Michel Zwawiak. Thanks! © Joerg Woerner, April 8, 2011. No reprints without written permission.